Despite the aphids that have infested Prince's Island this year, the first night of the Calgary Folk Festival was the sort of night where you lean back in your regulation height festival chair and contemplate life while soulful, heartfelt sounds waft from the mainstage. After a while you become used to the sap dropping on you from the trees, and since everybody else is also scratching their heads to dispel the aphids, it feels rather like communal grooming. For me, though, in my third year volunteering in the Record Tent (this year a combined record and merchandise tent), the day got off to a decidedly more active start. Working setup allowed me to log a few of my volunteer hours before the music even thought about starting, but it also meant a fair bit of sweat equity invested in lugging boxes of cds around. I will never be able to forgive Loreena McKennitt for sending 57,000,000 boxes of cds and dvds, which I had to find space for underneath the tables at the back. So, if you are looking for Loreena McKennitt merch, we've probably got it. Actually there are some really great artist t-shirts available in the record tent this year as well, and I noticed that many of them are now available in considerably larger sizes than used to be offered in past years. Evidently not just skinny little indie kids listen to music anymore. I should have guessed that the folk fest was off to a more leisurely start this year, when on my way onto the island at just before noon, I stopped to ask the first person in line for the 4:30 running of the tarps what time she had started lining up. Not till 5:00 that same morning, apparently. Generally people will line up overnight, but then again, the weekend is still young. After my shift, I did a reconnaissance of the cds and tees on offer and then darted over the media tent, where I was studiously ignored for what seemed like a very long time. I finally realised that they must have taken me for a simpleton who just liked to stand there with my mouth open looking at the pretty people or something, so I interrupted one person's rapt attention to a piece of paper to ask how I sign up for interview sessions. Pretty straight forward really, and on Saturday I expect to be talking to BC musicians Ferron, Carolyn Mark, and the Sojourners for my coverage of Calgary festivals for, you guessed it, BC Musician Magazine. I wolfed down a quick supper in the newly located hospitality tent, now beautifully situated among the trees along the river. Evidently those hospitality people are determined to ensure that I stay healthy this weekend, as I sat down to a plate piled higher with raw veggies than I thought would have thought possible without the benefit of earth moving equipment. I chose the tofu with broccoli option over the chicken, as I figured I didn't have quite enough veggies on my plate yet. Gotta counteract that gelato that you know you are going to have, right? Carolyn Mark emceed the night and she was resplendent in that red dress she wore on the cover of BC Musician Magazine a few months ago, the one where she is kissing Geoff Berner. She was typically sassy and irreverent and Chad VanGaalen goosed her when he came onstage to play his mini set. Justin Rutledge came on after the opening set by Los Misioneros del Norte, just after we ran into Ruh who was enthusiastically telling us that his album Man Descending was her second favourite from last year, right after Elliott Brood's Mountain Meadows. Now that's a pretty solid endorsement, so I gave Mr. Rutledge my undivided attention, and he did not disappoint. Beautiful heartfelt songs with melodies that pull you in and stories that keep you there. I then dashed off for a previously arranged meeting with a couple of fellow music lovers from BLIP, Jeff and Susan. Since I could not notch this up on my blogger meetup belt, I have unilaterally declared the existence of a BLIP meetup belt as well. They were absolutely adorable and I'm so glad we had the chance to meet and talk about how our lives would have been so much better if we had the internet when we were growing up and how kids today don't even know how lucky they are. We talked during most of Umalali, but they sounded pretty great as our background music - infectious rhythms, and one of the singers had the cutest nun glasses. Chad VanGaalen then played an odd little mini set, after which he just disappeared from the stage without even saying goodbye. I think he was trying to plug something in, as we could see him messing about with something and then the jumbotrons went black. When they came back up, he was gone. You know he'll more than make up for it at the Twilight Stage concert the next night; besides even when he is faily, he is great. Scheduled headliner Michael Franti came down with a nasty case of ruptured appendix and was obviously unable to perform, so the Woodchoppers Association stepped in to play the next set - a hard to pigeonhole melange of collaborative rhythms and improvisational jazz, leaving Iron and Wine to move into the headline spot. The singer/songwriter from Texas again mellowed the feel of the festival back down to a gentle buzz, as he charmed the already appreciative crowd with his intimate songs, songs that sounded strangely familiar although I am sure I had only heard a few of them before. He seemed to enjoy himself, gently chiding the audience for being so laid back, while complementing them on being so polite. Oh, perhaps it was one of those backhanded compliments you hear so much about these days. Regardless of his motives, Samuel Beam (aka Iron and Wine) established a gentle connection with the folks on the island, and left us to drift out of the park in a contemplative mood, fulfilled by the evening's offerings, hungry for what the next day would bring. Enjoy the weekend! Looks like the crowds descended last night. On my way home from work walking up to the train last night it seemed like everyone I passed was carrying a chair down to the festival. Sounds like an absolutely splendid time. I think you may have a Festivalling for Dummies book in you someday with all of those years of experience. Thank you so much for sharing. It really is a thrill to get your eloquent insight on these events. I may have to move to your city simply because of its amazing music opportunities! You have so much fun, Barbara. I don't mind saying that I'm pretty darn jealous. "Evidently not just skinny little indie kids listen to music anymore." I really have to get to this festival next year. I always love reading your posts and it sounds like things started off on the right foot. Best of luck with your interviews today!! Sounds like a blast. I hope Rutledge did "Jelly Bean." My kids and I love that song. Btw, I'm in Calgary on the 17th and 18th. Will you be around? 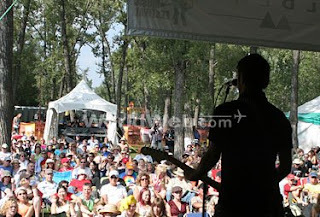 Sorry to hear you missed Michael Franti...one of my faves from Wpg Folk Fest last year. I am still chastising(?) myself for missing Emmy Lou Harris a couple of years ago...she was there...I was not! I saw very few non-regulation chairs, Urban Blondend everybody clapped along. A most splendid completely sold-out festival. Absolutely you must move here, Sean. I will need help writing the Festivalling for Dummies book. You can look after the festivalling part and I am more than qualified to handle the dummies bit. It's been fun central around here the last little while, I will admit, Charlie, but it's been one of those cases of pouring, not raining. It was an exceedingly memorable festival thing year, Al. You really really need to plan to come next year, bearing in mind that tickets sell out. I don't think he sang that one, not that I recall anyway, John. I would love to have the chance to meet when you are here! Baring something unforeseen, I will indeed be around. Yay blogger meetups! It's far too easy to miss far too much, Berni. You just have to agree not to have any regrets.